From a couple of years ago comes this lovely spring idea: Spring Vegetable Tartare. Feel free to improvise here. There is no way to go wrong and an infinite number of ways to go great. Enjoy this Ducasse wonder. I just posted a review of the wonderful new book by Alain Ducasse: Simple Nature. It’s not a vegetarian book by any means, for protein does appear, but it is vegetable-centric. This is the first dish we tried out of the book, making this veggie tartare to go along with our Easter lamb. It was, in a word, exemplary. Ducasse emphasizes cooking fresh with only the items available now in your local market, ideally a farmer’s market. This dish is so good, Suzi has added it to her spring menu for her cooking school, Cooking by the Book. So, once or twice a week, I’m eating my veggies. Happily. Eagerly. I know, it’s weirdly delicious. The Ducasse recipe calls for a condiment or sauce to be served. His suggestion is a sorrel-based one, using vinegar, shallots, olive oil, yogurt, and mashed hard-boiled eggs. Suzi is not a sorrel fan and we were busy with our leg of lamb, so we opted instead for some horseradish mayonnaise. If you get your own copy of Simple Nature you can try the sorrel condiment yourself. Or, you can do we did and substitute the accompaniment that fits your palate for that day. Ducasse won’t mind that substitution but he would frown mightily if you used frozen or canned veggies. You have to buy stuff with dirt on it. Prepare the baby fava beans and peas by shelling and peeling the beans. Set aside in a bowl. Shell the peas. Bring salted water to a boil in a saucepan and prepare a bowl with water and ice cubes. Immerse the peas in the boiling water for 2 minutes, then remove with a skimmer and shock in the ice water. Drain and add to the bowl with the beans. Cut off the leaves, scrape, and wash the radish. Wash and peel the carrots and turnips. Rinse, dry, and pluck the sorrel leaves. Trim and wash the onions. 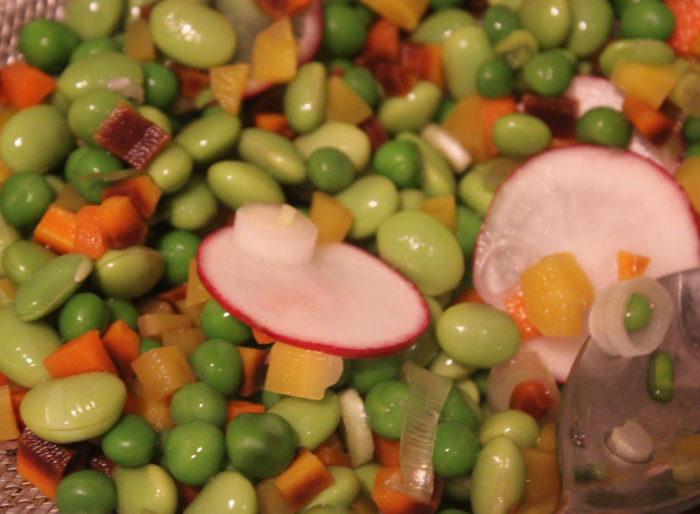 Finely dice the carrots, turnips, and onions and add to the bowl with the peas and beans. To finish the tartare, add the sorrel condiment and mix everything well. Season with salt and pepper. Serve very cold in the bowl or serve the tartare on individual plates.